Frame approx.. 44 x 35 in. John Coplans is best known for his photographs of a single subject—his own aging body. Often printed at larger-than-life scale, they include segments of his figure, which he carefully aligned within the frame of each image. Coplans frequently sketched his ideas in advance. Then, working with assistants, he posed in front of his camera, which was fitted with a video monitor to help the artist accurately execute his plans. In his photographs, the unidealized male body becomes a textured, sculptural object while the white background provides important negative space. 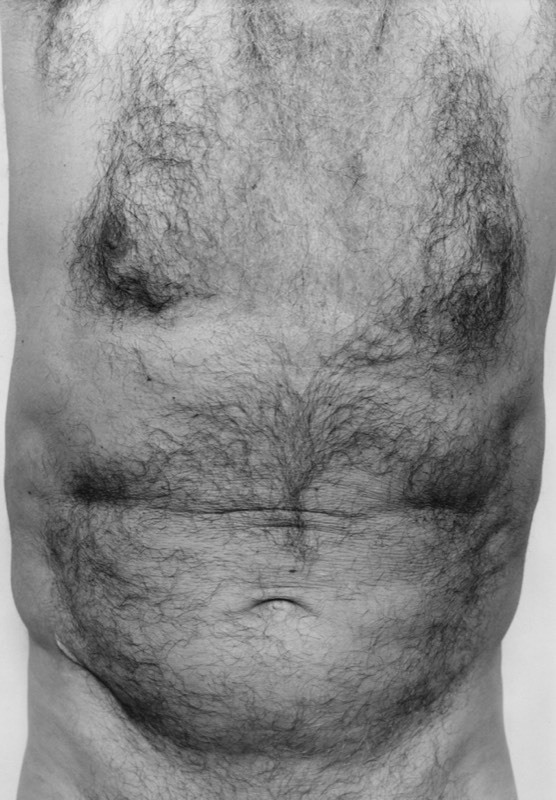 Coplans sometimes arranged certain parts of his body to resemble other images, and spoke of Self-portrait (Torso, front) as “a seventeenth-century drawing of a face,” a comparison that expresses the artist’s appreciation for art history as well as his dry humor. A respected curator, art critic and historian, as well as a founding editor of Artforum magazine, Coplans began taking photographs while serving as the director of the Akron Art Museum, then known as the Akron Art Institute, from 1978-1979. During his short tenure, Coplans guided the museum to focus its collection on modern and contemporary art with special attention paid to photography, a strategy that has significantly shaped the museum’s collection and identity over the past several decades. Self-Portrait (Torso, front) was purchased for the collection using funds donated by the Wojno family, Akron art collectors. Considered a canonical photograph, it has been included in several exhibitions celebrating the collection’s strength in the medium. Coplans was accorded the Knight Purchase Award for Photographic Media in 2002, when the museum augmented its holdings of his earlier photographs with additional purchases.